It is very difficult to get space here, but still Krishna has not given a big accommodating house. Srila Guru Maharaj wrote in his divine will the name of the London ashram. But that ashram was stolen. Now by the grace of Swarupananda Prabhu, Sagar Maharaj, we have this house. It may be small but it is a firm branch of Sri Chaitanya Saraswat Math. By the prayers and the service of the devotees we expect another place in the future, but at least this is better than nothing [chuckle]. You are all born devotees. "Foreign West," Srila Prabhupad Saraswati Thakur said when he gave charge to Sripad Bhakti Saranga Goswami Maharaj and sent him to London. At that time I did not know any English, but that expression I can remember. The strong desire of Srila Bhaktisiddhanta Saraswati Thakur was given form by Srila A.C. Bhaktivedanta Swami Prabhupad. We have entrance in this Western world by His Divine Grace: London, America, Russia, Germany, Holland, in the time of Srila Prabhupad. It was very rare to get Westerners, but by his strong desire and will, we have this position. At that time Subas Chandra Bose, a great personality of India, went to London to study. Some Westerners served him, and he was very proud. He wrote to his brother, "I am getting service from Westerners." But Prabhupad Saraswati Thakur and Bhaktivedanta Swami Maharaj made the whole world servitors of Sri Chaitanya Mahaprabhu. Now we are very proud, you can say, that the devotees here are wholeheartedly trying to serve Sri Chaitanyadev and Nityananda Prabhu and His glorious Sampradaya. Prabhupad Saraswati Thakur made sixty-four centers in India. They were divided by Srila Guru Maharaj, thirty-two given to Gaudiya Math and thirty-two to Chaitanya Math. Srila Guru Maharaj divided the management and they got that connection. Sixty-four maths were in India, but only one was in London. Prabhupad left this world and gave full power to A.C. Bhaktivedanta Swami Prabhupad for spreading Krishna Consciousness. Srila Swami Maharaj was the best friend of Srila Guru Maharaj. Now we can say both fulfilled the desire of Srila Saraswati Thakur. We are the devotee section, the devotee's devotee holding the exalted flag of Sri Chaitanya Mahaprabhu, proceeding now all over the world. Now ISKCON has more than 300 centers, and we have more than sixty. We are very little but very firm. You are all participating in that Sri Chaitanya Saraswat Math. You are so fortunate, no doubt, to get the opportunity to practice Krishna Consciousness in the line of Srila Guru Maharaj. In the finest way we are satisfying Gandharva Govinda Sundar. At present we also have seven or eight centers in India, but my full attention is currently going towards Govardan. The bell room there is decorated in the style of Srila Rupa Goswami's Samadhi Mandir. The domes are in the brihat mrdanga style  you can see on the Internet; every week there is a report. They are still building that Govardan ashram. That is the last job I am taking to satisfy the desire of Srila Guru Maharaj. Saraswati Thakur told Guru Maharaj: the Sakhis and Radha and Krishna will live in Radha Kunda, and we are the Manjaris, we will live a little far from Radha Kunda. That place is at the lotus feet of Govardan. In the early morning we will collect some flowers from Kusum Sarovar and we will go for service to Radha Kunda under the guidance of Lalita Devi and the Sakhis. 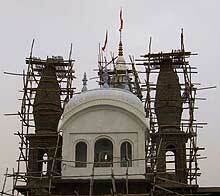 Srila Guru Maharaj also ordered me, "If you want to make any ashram in Vrindavan, you make in Govardan. That is our proper place." That time I could purchase some land on the way of Radha Kunda, but many sound disturbances are coming from the busy road, the lorries, the buses, and the temples. For that I took a little hidden place, Srila Sridhar Swami Seva Ashram. By the grace of the devotees we have that center. There are two houses there: one big house in the name Srila Saraswati Thakur and another named Srila Sridhar Swami Seva Ashram. 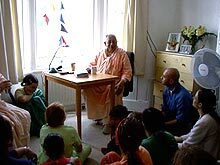 When you get the opportunity, come again and again and see the glories of that ashram, and try to give your energy for Guru Maharaj's dear place here in London. It was the desire of Saraswati Thakur to send Guru Maharaj to London. Now our Devashis Prabhu wants to print quarterly the 'Gaudiya Darshan' in the English language, and all dignitary devotees can help him through their writing. And I think it will come as soon as possible. Prabhupad Saraswati Thakur liked that very much in the English language.